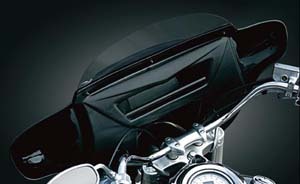 Upgrade your Road King w/Detachable Wind-Protection! 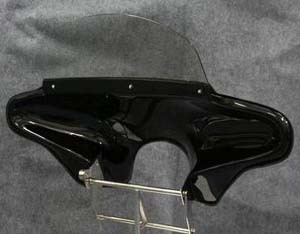 Our basic Batwing fairing: This fairings is made of strengthened fiberglass which makes your motorcycle fairing more durable than other more expensive, non-fiberglass motorcycle products. The product is made by talented craftsmen who are professional in transforming the highest quality, raw materials into a finished product by hand. It does include windshield and mounting hardware. Select windshield height and tint. 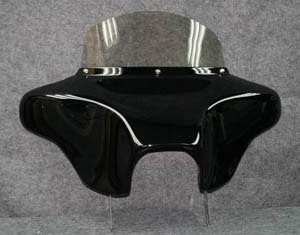 Fits Road King or Softail platforms. Note: Special sale order, ships 3-7 weeks after order placement. 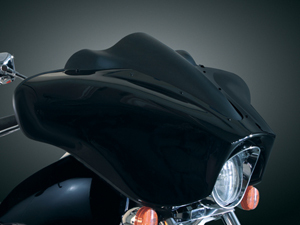 Transform your Road King into the ultimate bagger with this new detachable fairing. Thermo-formed from the same high-tech materials used on automotive body panels. 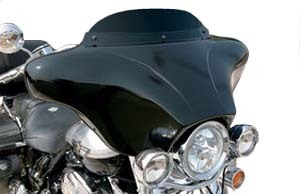 This fairing provides superior fit-and-finish, fade and impact-resistance when compared to other aftermarket fiberglass or acrylic fairings. The outer shell is finished in vivid black automotive paint with clear coat while the stylish inner shell features a black textured surface and includes a 13.5”W x 3”T x 3”D storage compartment to keep those small essential items handy. 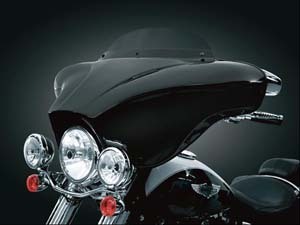 Now you can add superior wind-protection and that cool bagger styling for the same cost of most factory windshield kits. Fully customize your fairing with Kuryakyn windshield trims, windscreens, and most other accessories compatible with the standard H-D 3-hole windshield pattern. With a simple, 4 fastener mounting system, this beauty comes fully assembled for a quick, easy and secure installation. Sportech Detachable Fairing – PLUS: Traditional style with a little extra, this beauty comes with a 3 inch black windshield & can be fully customized with Küryakyn windshield trims, windscreens & most other accessories compatible with the standard H-D 3 hole windshield pattern. 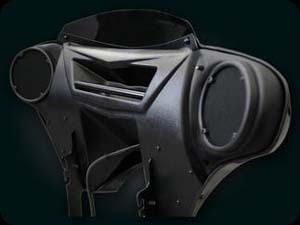 DSF-99: Powerful & compact, these 5.25” weatherproof speakers & 50 watt amplifier combination was developed specifically for motorcycle applications ensuring loud, clear & full-range audio even at highway speeds. Simply connect your iPod®, MP3 player, satellite radio or cell phone with the standard 3.5 mm input, & rock on! The auxiliary volume control is mounted on the right speaker pod & an additional USB port is included for general charging of music devices. 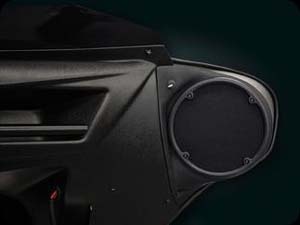 The speaker housing are matched directly to the outer fairing pockets & an included plug-&-play wiring harness makes for a simple & clean installation. Notes: Softail applications require mounting kit (sold separately). Requires removal of all pre-existing windshields and windshield mounting hardware for proper installation. 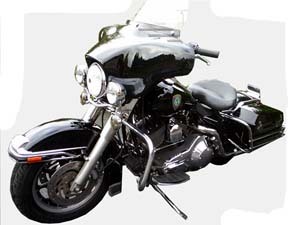 Installation is possible on ‘04-’07 FLHRS & ‘90-Up Fat Boy (with P/N DSF-92 for Fat Boy), however it requires removal of chrome wind.